Traveling with running shoes can be a pain. They add weight and extra bulk to an already heavy load. On planes, running shoes can take up valuable space in your carry on. Or add weight (and $$) to checked baggage. You could wear them on the plane – but if they are like used and smelly like mine, better to keep them locked away in your bags. The solution is a running shoe that’s cushioned, supportive – but also lightweight and easily packable! A tall order for sure. 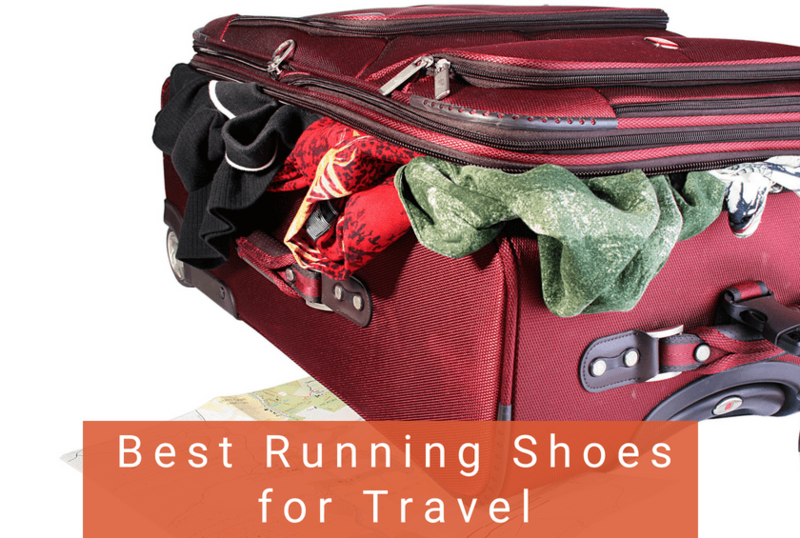 But we’ve compiled a list of the ten best running shoes for travel. The list is comprised of a variety of styles and brands, all with something different to offer travelers to make their lives easier in the long run. We will give you a brief overview of the features that each shoe offers, then we will offer you some pros and cons to help you make the ultimate decision on which shoe is right for you. 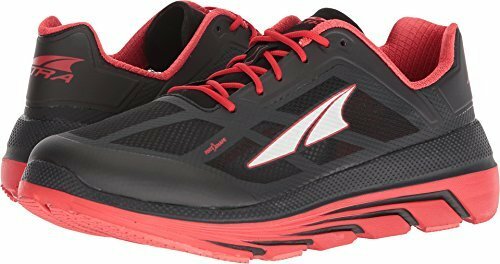 The Launch 6 is Brooks’ best lightweight running shoe. It still has plenty of cushioning and support. And with a seamless upper, it manages to pack down in your bag. The Launch 6 comes in great colors and a nice look for men and women, but doesn’t give up comfort or support. This makes it great for travel if you plan on wearing these for walking or casual wear in addition to running. The Launch 6 – while nicely cushioned – isn’t as plush as it’s big sister shoes, the Ghost 11 and Glycerin 17. But it does have a snappier ride thanks to the BioMoGo DNA midsole that cushions while also adding a rebounding, springy feeling. The sole of the shoe features a mid-foot transition zone that is designed to help you go from heel to toe quickly. The Air Mesh upper is breathable and super light. Like other Brooks shoes, the Launch 6 has a nice wide toe box and runs true to size. It fits great. As an added bonus, the Launch 6 is one of the best values on the market, only costing $100. The Launch 6 is a serious upgrade from its predecessors, and has been incredibly well received in the running community. It is an excellent travel shoe for its comfort, roominess, and light weight. The Saucony Kinvara 9 is another lightweight shoe that still provides ample cushioning. Like the Launch 5, this shoe is light and packs easily thanks to flexible upper. 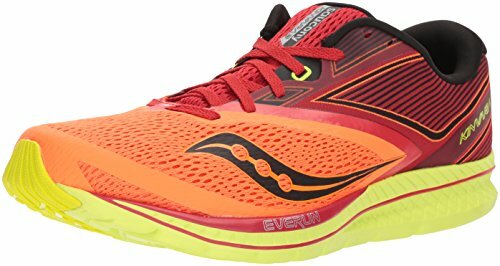 This shoe has a new EVERUN top sole that provides nice energy return and some added cushioning. Combined with lightweight EVA foam, the Kinvara has one of the best weight-to-cushion ratios in the entire running shoe market. The Kinvara 9 kept the 4mm heel-to-toe drop for a natural running feel. One downside to the shoe is there isn’t much rubber in the outersole. So while it’s light and fast, you won’t get as many miles out of the shoe as other models. 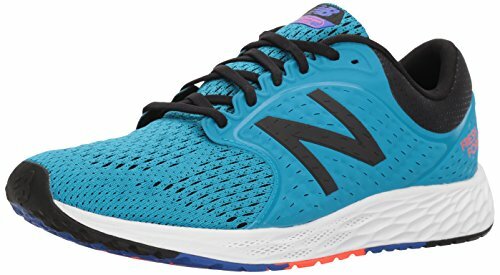 This nice, lightweight shoe by New Balance is ideal for travel because of its weight, size, and excellent fit for runners of all abilities. 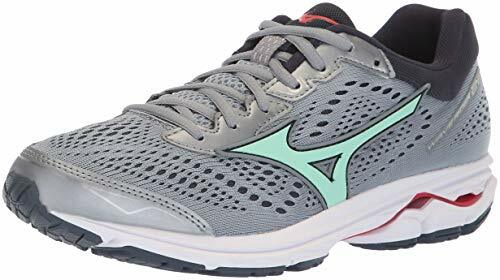 This is a comfortable shoe with excellent support and some room up front for your toes to move around. The Zantev4 is a versatile shoe that can be used in many conditions and on many surfaces. Like the Launch and Kinvara, it’s a lightweight shoe with nice cushioning. The Freshfoam midsole provides a zippy, responsive ride. This shoe will give you great support if you’re using it as your primary shoe for a plane trip as well. The width of the shoe helps you to avoid that “trapped foot” feeling that can happen during long distance travel. The New Balance Fresh Foam adds support and comfort so you can use this shoe daily or just as a travel option. The 22nd version of the Mizuno Waver Rider is a great update to the line. This installment features nice cushioning, breathability, and a fast, responsive ride. While Wave Rider 22 is a heavier than some of the other shoes we’ve looked at, it’s still lightweight and well cushioned. It’s more durable and will hold up better for long runs. The upper on this shoe is made dual-layered mesh for breathability and comfort. Coupled with the INTERCOOL technology, your feel are sure to remain cool and dry even on the hottest days. The DYNAMOTION FIT makes the upper move with your foot so well that you may forget you’re even wearing a shoe. The midsole helps to ensure a smooth transition from heel to toe. U4ic technology in the midsole and heel provides shock absorbtion and a superior ride. Another midsole layer features U4icX, an even lighter and more cushioned version of the U4ic, for added softness underfoot. This shoe is pretty big in terms of the other shoes we have reviewed thus far. It would work well as a shoe to wear during travel, especially if you are doing long runs. But it’s not as compact as the other shoes. This lightweight shoe is built for anything from interval workouts to long runs. Perfect for travel running when you aren’t sure what surfaces or distances you will be able to run. The cushioning technology in this shoe allows for a spring-like feel under the foot and a smooth transition through your stride. The midsole is responsive enough for intense workouts and light training. This shoe is made for neutral runners with limited pronation control. This keeps the shoe lightweight but isn’t ideal for runners who overpronate. If you are planning to wear this shoe through the airport, it is an excellent option. The offset makes it gentle on your legs, so you won’t have to worry about potential injury from sitting for a long period and then moving quickly. Like all of Altra’s running shoes, the Duo features a wide toe box and zero drop design to allow for natural, barefoot-style running form. But the Duo is great for travel as it’s lightweight with plenty of cushioning. The Duo sheds most of its weight with a thin, breathable mesh upper. This not only keeps the shoe light, but provides nice ventilation in hot climates. And while the midsole is fairly thick – which is great for cushioning – you might not expect it to pack down well. But the thin upper allows you to really compress the shoes down. Altra’s FOOTSHAPE toe box creates a roomy area for toes to spread naturally. An added benefit is it makes these shoes feel great. They are almost like wearing slippers. So these double as walking shoes or a nice option for wearing on the plane or car. The materials are durable and lightweight without giving up on cushion, stability and support. This is an awesome shoe to travel with. This shoe was actually designed for triathletes. But the attributes that make it good for triathletes also make excellent shoe for travel. Both the men and women’s designs have been recreated with FlyteFoam technology in the midsole. This lightens up the shoe while still providing nice cushioning and energy return. This shoe features seamless construction in the upper. to reduce irritation from seams and stitching. The upper is also thin and breathable, making it good for compressing and packing down. The Noosa FF 2 has slight pronation control – so it’s a good option for runners with low arches who overpronate. Finally, the Wet Grip outsoles on the Noosa FF 2 enhance traction on wet surfaces, so you will have optimal traction regardless of where you are traveling to. Hoka One One is known for making shoes with max cushioning. The Cavu is one of their lightest shoes they make. It’s not as cushioned as Hoka’s other shoes, but still has plenty of pillow-y softness in a package that looks more like a regular shoe than the thick-soled Hokas. 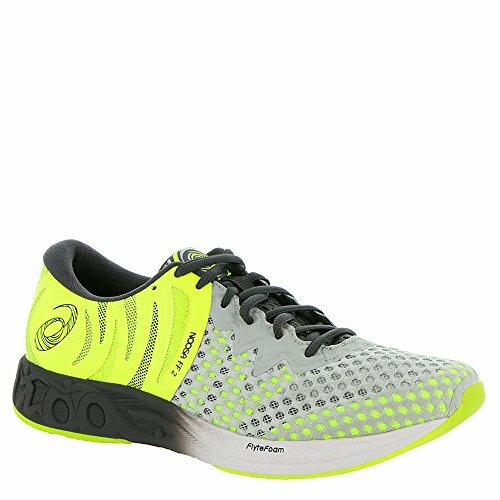 The PROFLY cushioning adds a softer feel to the heel to absorb shock while keeping the forefoot firm. The result is nice energy return for a snappy ride. In addition, the Cavu’s outersole has zonal RMAT for traction. 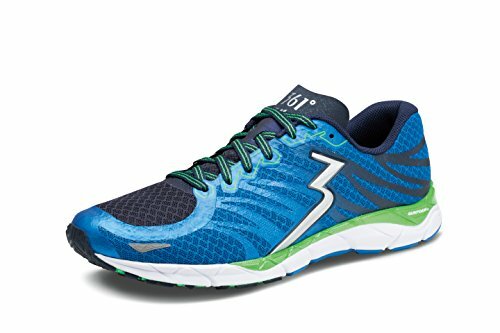 This is a lightweight shoe with a mesh upper for breathability. It has a lycra comfort-fit bootie beneath the mesh for seamless feel. The internal reinforcements in this shoe add support and stability, so whether you’re wearing them on planes, people-movers and escalators or you’re going for a morning run in a new city, you will never have to worry about losing your footing. The sole on the Cloud offers CloudTec technology for a smooth ride, as well as increased grip pads. 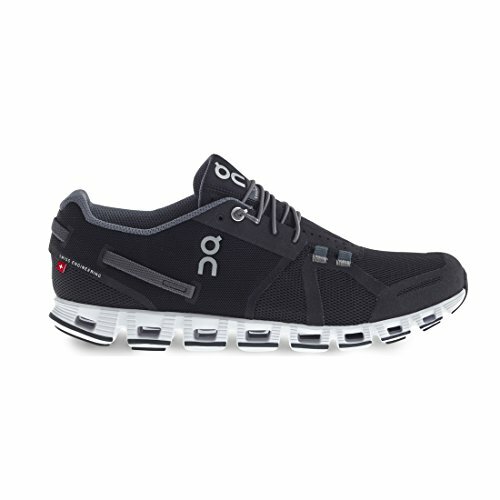 This is an innovative shoe that is ideal for travel and for running. The midsole in the Cloud has been updated with the newest version of Cloud foam. It has a dual density material to take your comfort even further. The V-molded heel adapts to your foot to give you a snug fit that will give your feet the feeling of freedom without sacrificing stability and support. And the sockline provides a great feel when you put your feet in the shoes. Our favorite feature of this shoe is the easy entry speed-lace system. This is an ideal feature for travel. Imagine walking through security in your most comfortable pair of running shoes and not having to take the time to untie and retie your shoes! This shoe is an ideal option for everyday running and traveling with ease. 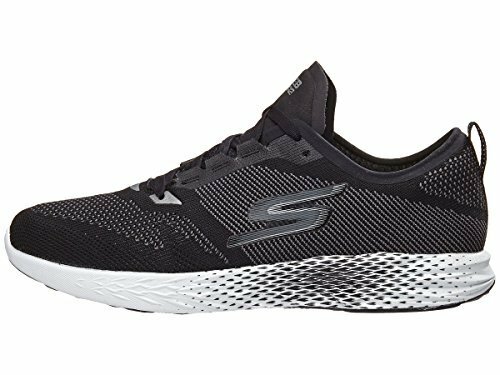 These are some of the lightest Skechers shoes on the market .They are true to size, so you won’t have to worry about a poor fit when ordering, and they offer superior comfort and support for almost any condition. These shoes have a mild stiffness to them, but that only encourages forward motion and adds energy to your run. The added cushioning helps to reduce pressure to the heel on impact. This shoe is virtually seamless thanks to FITKNIT supportive upper. The upper adds comfort and breathability to the shoe. The FLIGHT GEN cushioning midsole adds comfort mid stride, and the molded heel keeps your foot in place. The pull tab on the heel makes this shoe easy to put back on after heading through security at the airport, making them an ideal travel shoe when you add this detail to all of the comfort and support the shoe offers. Thin tongue can cause discomfort.